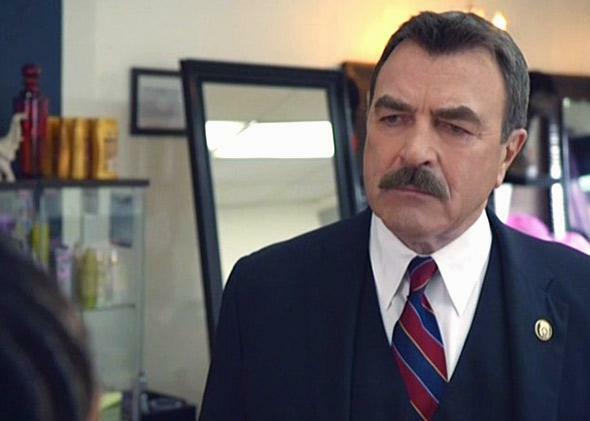 Blue Bloods starring Tom Selleck: The NYPD, white viewers, and black New Yorkers. Network TV’s most popular Friday-night series, CBS’s Blue Bloods, perfectly caters to your perspective on the police. Tom Selleck in Blue Bloods. Over the weekend, the deep divide between the police and their detractors—and in some ways between white America and minorities—gained a defining image: NYPD officers turning their backs to Mayor Bill de Blasio during the funeral of a slain officer in retribution for the mayor’s “anti-police” comments. Much like the recent protests across the nation, sparked by the high-profile deaths of several unarmed black men at the hands of police, the mayor’s comparatively gentle acknowledgment of the well-documented racial disparities in the criminal justice system has been met with a troubling reaction from both the police and much of white America: that acknowledging systemic racism and asking for police accountability is unnecessary at best and treacherous—or even dangerous—at worst. There’s a television show perfectly scripted to both cater to and reinforce this perspective: Blue Bloods, a CBS crime drama that revolves around the ruling family in New York City law enforcement. Blue Bloods is currently the most popular network television show on Friday nights—though you may be forgiven for having never heard of it, given that the median age of its viewers is older than 60. Led by paterfamilias and NYPD Commissioner Frank Reagan (Tom Selleck), the family at the center of Blue Bloods also includes his father, Henry, a former NYPD commissioner; his detective sons Danny and Jamie; and his daughter, Erin, an assistant district attorney. Despite the fact that they are one of the most powerful families in New York—and certainly the most powerful family in the NYPD—Blue Bloods insists on depicting them as salt-of-the-earth, blue-collar types who don’t get any special privileges. They’re just regular guys, really, and they have lots of their own problems too. It’s not easy being a Reagan! Like most of us, the Reagans think of themselves as good people, and in many ways they are: They believe deeply in the ideas of justice and equality, they always try to help people and do the right thing, and they stand up for their beliefs. But despite all their nobility and good intentions, like all white people, the Reagans exist within a system that is rigged to favor them, and to erase the problems experienced by people who don’t look like them. Because in this case the system is also a TV show, the cases that the Reagans encounter—especially the ripped-from-the-headlines ones about race and excessive force—offer constant reassurance that there are no true racial issues within the criminal justice system that can’t be solved by a speech about colorblindness or the steely resolve of Tom Selleck’s mustache. Worse, Blue Bloods has a habit of depicting people who speak up against the police as malicious, manipulative, or deceptive—and a lot of those people happen to be minorities. In one recent episode, Detective Danny Reagan (Donnie Wahlberg) chases a black suspect through an apartment building—but while Danny’s holding him at gunpoint, the suspect throws himself out a third-story window, and then lies writhing on the ground below, screaming police brutality. As a crowd of angry black citizens gathers, we pan up to Danny’s confused face and presumably feel sympathy for the cop unfairly framed by the lying black suspect. Later, things get worse for Danny, when a prominent black minister and community leader bribes a family of illegal immigrants with a new apartment so that their child—an eyewitness—will give false testimony against the officer. Things sure are tough for cops with all these black people out to get them! These aren’t new developments on the show. In the second season, racial tensions run high in an episode titled “Black and Blue” when two officers force their way into the church of the same black minister, the Rev. Darnell Potter (Ato Essandoh), after an anonymous report of a man with a gun inside. Rather than addressing the reasons for the black community’s distrust of the police, however, the show reveals that Potter orchestrated the whole thing by compelling a mentally challenged young man to call in a false report in order to provoke an incident and get media attention for his cause. That’s right: The only reason the black community had problems with the police was because they were literally asking for it. More relevantly to the current situation in New York, a fourth-season episode presents us with a painfully familiar story: A young black man is shot in the back by an officer who claims the man had a gun—and yet no gun is found on the body. At the end of the episode, Frank manages to set everything right by getting tough with the Latina owner of a local bodega, who confesses under his flinty gaze that she stole and hid the gun after the shooting because of her personal problems with the police. Do these stories sound familiar? In Blue Bloods, accusations leveled at police by citizens are almost always revealed to be fraudulent, and concerns about racial bias are almost always manufactured, deceitful, or overblown. These parables perfectly buttress the way much of the show’s older, mostly white audience feels about the police in America in 2014—and how they feel about the people who challenge those perceptions. Despite how often the show touches on thorny political and social problems, it tends to be far more interested in reassurances than revelations. Even though it is largely a show about detectives, Blue Bloods is dedicated not to investigating but to soothing or diminishing the fears around issues like racial bias—either by having Frank step in to magically fix the problem, or by discrediting the people who suggested that there was a problem in the first place. Narratively, these easy outs are yet another convenient loophole of the system, one that allows the brave, upstanding Reagans to have their cake and eat it too: to stand up for their convictions about justice and equality, but never truly face injustice and inequality. The Reagans of Blue Bloods represent something both tremendously dangerous and mundane about white culture: power that doesn’t understand itself as power, prejudice that doesn’t understand itself as prejudice, and worst of all, white people who don’t understand how much damage they can cause when they refuse to acknowledge either of those things. For everyone who is troubled by stories of dead black men in the headlines but who, deep down, simply wants to turn away, Blue Bloods is the perfect white-privilege lullaby. Despite all the hullaballoo from troublemakers and unfortunate isolated incidents, Blue Bloods reassures, there are no deep, systemic issues of racism that we need to address—just a few bad eggs who will ultimately be checked by a fundamentally fair system. Indeed, Blue Bloods isn’t a fantasy depiction of how we wish the police could be—it’s a reaffirmation of how the show’s viewers already think they are. Rather than putting the poor, beleaguered police force through more hassle over these issues, Blue Bloods insists, we simply need to have more faith in it and believe that the good people who hold power—good white people like the Reagans—can be trusted to right any imbalances and, of course, to police themselves. In another recent episode, “Forgive and Forget,” Frank unilaterally resolves the Eric Garner case almost as a side note, firing a cop (off screen) who killed a suspect with an illegal chokehold but was not indicted by a grand jury. (“I think I know better than any grand jury what kind of cop I want at my command,” says Tom Selleck’s mustache.) Somehow, Frank faces no backlash from the NYPD for being “anti-police,” and balance is once again restored to the force without any deeper reform. But another tough dilemma immediately presents itself when another officer accidentally shoots his partner while intoxicated, and his fellow cops try to cover it up. Ultimately the man is permitted to quietly resign instead of facing charges, handing his badge to Frank in a melancholy scene in which the two aging white policemen gaze at each other, a look of fraternity in their eyes. “No one ever laid on their deathbed thinking they should have been tougher on their friends for their missteps,” one of Frank’s top advisers tells him. It’s a sentiment that feels like it could be the motto of the real-life NYPD, the one that that dared to turn their backs on Mayor de Blasio, except that perhaps it does not go far enough: What we really have is an NYPD where no one thinks their friends should be accountable at all.